(What do you think when you read about a local cemetery being desecrated, a synagogue vandalized, or perhaps some centuries-old Hindu shrine blown to pieces? Maybe, like me, you wonder: Why can’t people just “live and let live”? 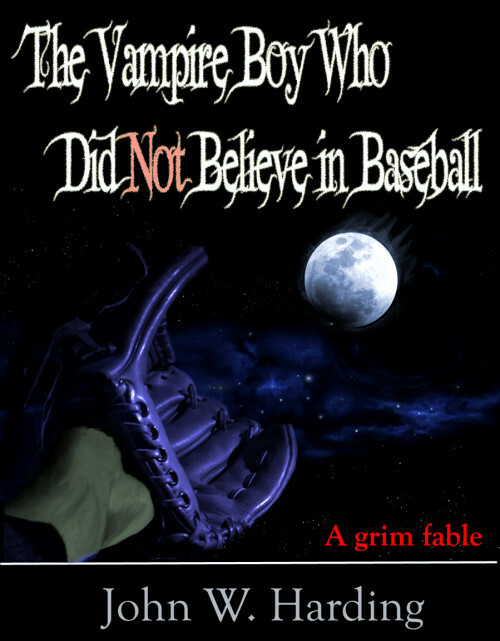 In a distant, little-known valley — so distant and little-known that it did not yet have a single electric company — there lived a vampire boy named Russell who had never heard of baseball. Vampires were required to stay inside during daylight hours, naturally, and without electricity any baseball players had to cease their game at dark. Like all others in his castle, Russell could only stir when the last slice of sun dipped behind the mountain pass. Then the candles would be lit so spiders might see to spin their webs, and Russell’s family would come together in the parlor before flying off to work. Russell’s father was one of the undead, but he was not aging well. He could no longer seem to keep his hair combed neatly, and even his ebony cape did not hang off his shoulders in the same smart way it did in the old home movies. That’s a fine kettle of frog legs, thought Russell. How will I ever learn all I must know if he never allows me to come along? The moon was bright in the night sky, and down below a solitary tree here and there left a long shadow like a warning finger that pointed the direction home. But Russell was determined to go farther than he had ever gone before, even if that meant going outside what is considered a vampire boy’s comfort zone. Before he knew it, he was flying over the dark forest, and off in the distance sat tiny glowing windows. Those would be the cabins of the hillside people, thought Russell, being kept warm and cozy by their fireplaces. There was a large clearing in the trees below that Russell had never seen before, and down on the ground was sketched the white outline of a large, unusual shape. It was not the shape of an animal nor a drawing of some villager’s home. No, at first he thought it must be an arrow, but it had four points, and as he got lower he could see that it was more like a box. If this was a garden, it was not a fertile one, he thought. For nothing at all seemed to be growing within its borders. “What can this be?” he wondered, circling twice more above it. With each pass his curiosity emboldened him, and he dared to get lower and lower in hopes of unraveling its meaning. Each of the four points had a small white pad or cushion at its peak, and one point had two more boxes drawn around it and a chainlink fence standing behind it. Russell did not know if it was safe for him to get any closer. Perhaps it is some sort of little vampire trap, he thought. So he decided to return to his castle until he could find out more about what he had seen. “It’s called a diamond,” said Russell’s Uncle Linus, who had overslept and was only now deciding on which cape to wear into town. “A diamond that big must be worth a lot of money,” said Russell. A human game? wondered Russell. Since when did humans play games, or have fun, or do anything but shriek and run in terror when they saw his family leaping from the upstairs windows at sundown? Russell loved his family, but he was not proud that they made the little village boys and girls cower in fear. He knew that if ever the villagers were caught outside when night descended, they instantly dropped what they were doing and ran for the fire-lit security of the nearest home. Russell’s people respected the villagers’ right to be safe inside their homes, which is why the two species had co-existed so peacefully together for so many generations. Now, it also happened to be true that on certain days following a full moon, the darkest of night came sweeping through the land more rapidly than expected. This is indeed what occurred the very next night, when Russell was so eager to have another look at the strange diamond that he could hardly wait to get in the air. Sure enough, the villagers had been out, and when the darkness had caught them by surprise they dropped what they were doing to scatter hither and yon. Russell decided it was safe for him to land. All over the abandoned field lay the most curious items. There were long sticks almost as tall as Russell himself, tapered to a nub at one end and yet as smooth and hard as Uncle Linus’ bald head. There were large oven mitts with webbed fingers made of leather. And there were scary-looking face masks with wire grids attached across the mouth. Russell wandered across the diamond, lifting each item for a quick examination before heading to pick up the next. “Give me a hand, will you?” came a voice from the dark. Its suddenness gave Russell a start and his impulse was to take to the sky. But something matter-of-fact in the tone of the voice helped to calm him. It was not in the least bit threatening. In truth, Russell was simply too fascinated by what he had found to give it all up so quickly. “A hand with what?” he asked. “Packing up this stuff,” came the reply. Russell thought the word had a nice sound to it. What could it mean? “You new around here?” asked the chubby boy. “Here, catch,” shouted the boy in the cap, and with a flick of his wrist let loose a stitched ball about the size of an apple. It hit against the front of Russell’s dark cape, then slid down through its folds and landed at his feet with a thud. “I thought you could see just fine,” said Charles. There was that word again. Russell was growing slightly annoyed. It didn’t mean anything. Why was this Charles pretending that it did? He watched Charles scoop up a couple more items and drop them in his sack. Russell realized for the first time in his life that he did not enjoy being made to feel inferior. He did not like to hear about things that didn’t make any sense, and he especially didn’t like being told it was his failing for not understanding. A tide of anger rose in him, and he began to give Charles a piece of his mind. It got very quiet on the field all at once. Russell never really thought that the young human was pulling his leg. He didn’t seem to be taking any pleasure in trying to get Russell to believe his lies. In fact, he was frowning now with a sort of sadness. Russell liked the idea of seeing life in a new way. The thought of living forever in a castle with the same people night after night, doing the same things, making the same jokes, sweeping up the same piles of bat droppings — it was all beginning to seem like a pretty lame way to spend eternity. And then there was the guilt he felt over causing the villagers to run and cower in fear. He carefully tucked the Goslin glove inside his shirt and turned to hurry off before Charles changed his mind. Indeed, the vampire boy was so excited that he completely forgot that he could fly until he had walked all the way across the diamond and into the dark woods. There was one castle legend that had long obsessed Russell. Someone far back in his ancestry had once somehow undergone a magical transformation that amounted to a cure. It had turned him from a vampire back into a simple human being. After that, he no longer had to go searching for his sustenance at night, and no longer felt the need to bite the necks of scary, grown-up ladies too careless to lock their bedroom windows before climbing into their beds. This reformed vampire was even able to venture out into the sunlight and mix with villagers. He was said to have found a normal woman to love him, and together they had had six normal human children of their own. Maybe this Goslin glove was Russell’s key to such a transformation! Was that what Charles had given him, a powerful talisman to break the curse of remaining a “child of the night” until the end of time? Russell thrust his hand in the glove and held his arm straight up at the moon. He imagined being able to catch the lunar orb in his leather web, for with this miracle glove all things seemed possible. He could play baseball with the stars! Maybe his father had been right. Maybe his flying skills were still too limited for him to go along with the others. But that was sure to change once he got back to the castle and had absorbed the Goose Goslin mitt’s magical power. For a long while after he arrived, he pondered the best way of unleashing the glove’s secrets. He put aside all of his other concerns about the mysteries of baseball and concentrated only on tapping into the magic of the Goose Goslin mitt. He lit candles around it like a shrine, and babbled incantations over it that he found written in the Roget Book of Spells. Near dawn, when at last he heard his father and cousins beginning to return, Russell carefully hid his treasure away and settled down to sleep. He would not be transformed this night, so, sadly, there could be no baseball game for him the next afternoon. Through all of the following night, Russell attempted to unlock the spell within the glove. But no matter what he tried — incantations, coatings, rubbing, chanting, crystals — nothing worked. In desperation he lit small fires under the webbed fingers and bathed the cowhide palm in eagle’s blood. By the third night, Russell did not need to fly into a rage because he was already there. He decided that the myth of a magical mitt was a sham, and that meant that everything else Charles had told him about baseball had been a lie as well. He gathered together some matches and paper and when the castle was dark and quiet, Russell headed out one last time to find the baseball diamond. On his way down, he snapped a bough from a tree top, and this was what he used to wipe out the white chalk lines in the dirt. Then he found the canvas sack of equipment in a nearby storage chest and built a big bonfire next to the chainlink fence. When the flames grew high enough he dropped the sack in the middle of them and stood back to watch. “It’s all a fantasy. The sticks, the diamond, the face masks. They have no purpose. They have no meaning. You lied and —.” Russell stopped himself. “And … what?” asked Charles. So now Russell knew what he had to do. It was the only thing left that he could do. He latched hold of Charles in a flash and bent his head to one side and as Charles wiggled and squirmed to get away, Russell sank his sharp fangs deep into the pulsing warmth of the boy’s neck. For the next half-hour, Russell sat next to the fire with the lifeless body, waiting to see if maybe there would come a transformation after all. But apart from feeling betrayed and hurt and very, very full, Russell felt nothing. He happened to return to the castle just as his father and Uncle Linus and the others of his clan were getting in. Russell knew he felt no different than before, but his father seemed to sense a change. “Russell, my boy, I have been thinking. I have decided it is time you started to come along on our trips to the village,” said his father. Russell’s eyes slowly lifted and he gave his father a weak smile. “Tomorrow night, my boy, we fly into the village together, right after …” His words trailed off and he waited until he saw Russell searching his face with a sudden glimmer of optimism.